Facebook is doing a big public relations push today to promote its “Year in Review,” lists of the top topics and videos on the platform, and Chief Operating Officer Sheryl Sandberg appeared on the Today Show as part of the festivities. 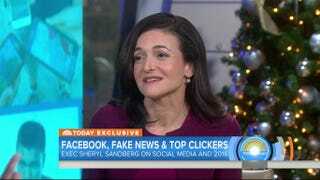 During her interview, Sandberg dodged questions on fake news and failed to provide any meaningful information about its spread on the platform in the lead up to the election. Though she was happy to announce that the U.S. election was indeed the most discussed topic globally on Facebook this year. Well that’s a rehearsed line if ever we’ve seen one. Guthrie tried again, asking if fake news played a bigger role [in the election], in retrospect, than Facebook thought.